I've been asked to set up a cake display table for a bridal show coming up. I don't know if I should or not because I have not made an actual wedding cake before. I really want to do the bridal show. 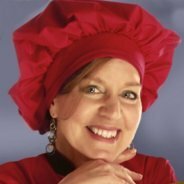 Can you please give me your opinion on whether or not I should do the bridal show? Thank you. Actually this brings me back to how I got started. A girlfriend asked me to make her wedding cake. I had never made one before. I did a practice cake and the rest is history. That was over 25 years ago. 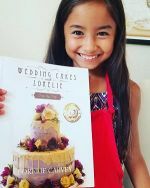 Are you required to make a real cake and sample people with a tasting? Would you be displaying a real cake or a fake one? 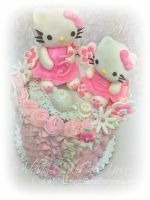 I would think that you could make a dummy cake ahead of time using fondant or royal icing, and a real one that you can cut at some point. Or have sheet cakes for cutting and sampling. Regardless make a real one so that you have some experience before doing the show. Cake decorating for weddings also has ideas for you. How much time do you have? 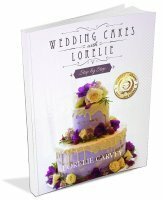 I have an ebook that is now for sale and some DIY pages Making wedding cakes has a detailed list of tools that you need and links to other useful information. Basketweaving is a simple yet impressive way to show off and impress people. Fresh flowers and fruit or simple ways to decorate and impressive yet easy. I have lots of wedding cake designs to look at for ideas. 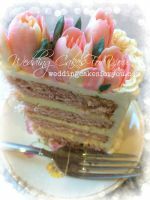 I hope this encourages you to move forward and take on the wedding cake challenge. If you need more advice or encouragement please let me know. You can contact me through my contact page or use the comments link below. Thanks Roodie for visiting and asking a great question. No one has asked me about doing a bridal show before. Thank you so much for the information. I am starting to think of different dummy cakes I would like to use. I just got a fountain so I will probably use that and then I know cupcakes are in now so I am planning on doing some cupcake dummies. Oh and I wanted to ask you before. When doing a display table what would you advise someone to put on the table. I know I plan on giving discounts to all bridals that place a deposit down on an order but I don't really have everything down yet. I am really excited the only bad thing is that the bridal show is Sunday 2/19/12. Hi Roodie, I like the fountain idea, this will attract attention. 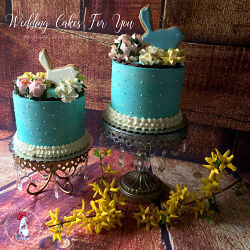 A cupcake wedding cake is a another great idea. If you have a little something that your potential customers can take home with them, they will remember you and it's always a nice touch. For example, a small party bag with a tiny taste of your cake, business card or something with your contact information on it, a coupon for a discount if they order by a certain date, a list with descriptions of your flavors etc. Have a raffle? You can collect their contact info in this way and have some kind of giveaway at the end of the show. These are some ideas , let me see if I can get more ideas together for you. Would LOVE to see a photo of your set up when finished.